The winged disc is a well-known solar symbol that can be traced back to early Egyptian times. It was taken over by later cultures such as the Assyrians and Persians. Here it is shown with the supreme God of Zoroastrianism, Ahura Mazda, in the middle. 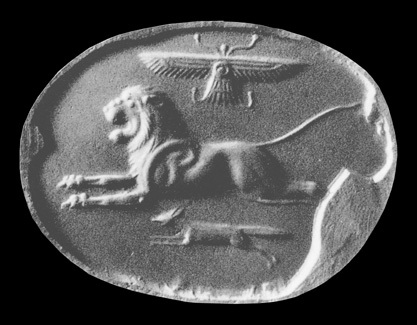 In this impression of a Graeco-Persian engraved seal from the fifth or fourth centuries BC the sun is shown with a lion and a fox. During this era these were the constellations representing the spring and autumn equinoxes, both of which were important festival times in the Persian world. The Zoroastrian religion of Persia divided the whole of creation into those works of the good god Ahura Mazda and those of the evil demiurge Angra Mainyu. Foxes featured in Zoroastrianism in two symbolic roles. In the holy book, the Avesta, they are described as products of the good creation and punishments are specified for anyone who harmed them. However, as a constellation the fox was part of the World in Motion which had been created by Ahura Mazda to provide an arena to combat evil. In time this age of theWorld will come to an end and evil be vanquished forever. 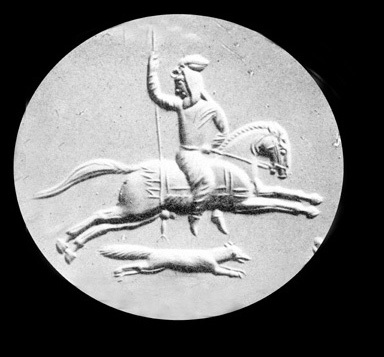 A number of these Persian seals show foxes being hunted or killed, contrary to the precepts of Zororastrianism. They feature hunters dressed in the manner of priests or Magi and show them using tridents, symbolic weapons which are impractical for any purpose other than fishing. Phyllis Ackerman pointed out eighty years ago that these are images of the constellations being symbolically hunted as an act of defiance against Evil in the Material World.